All things 787: Boeing rolls out the first 787 for American Airlines. Boeing rolled out the first 787 for American Airlines on Oct. 6th. The aircraft was originally supposed to be delivered in November is now slated for delivery on December. It is on the 40-51 Ramp finishing up assembly activities followed by painting. Additionally Boeing has finally delivered one of 3 787-8 flight test aircraft to a customer. The Fuerza Aérea Mexicana (Mexican Air Force) took possession of ZA006, the last test flight aircraft. After undergoing extensive re-work and re-build, the aircraft was bought up to FAA certificate standards though I am not sure if it has it full passenger interior installed or not. The aircraft is at the Charleston Delivery Center and is supposed to fly away tomorrow Oct. 9th). As you can observe the average time it takes to build the 787-8 (this includes both Charleston and Everett) is fairly stable. As Boeing get more familiar with building the 787-9 and the need for change incorporation goes away as well as the need for extensive time to finish traveled work, we should see build times for both versions of the 787 go down to below 100 days. There is still no known timetable when the stabilization of the production system will occur and it appears that Boeing is continuing to struggle with traveled work which has been the bane of the 787 program currently. There has been flashes of hope for a 90 day rate or lower (start of final assembly to contractual delivery). For example Boeing delivered a 78 to Tui Travel in 84 days from Everett and Charleston delivered a 78 in 86 day to Kenya Airways. 2015 should bring much required and welcomed improvements to the 787 production system. 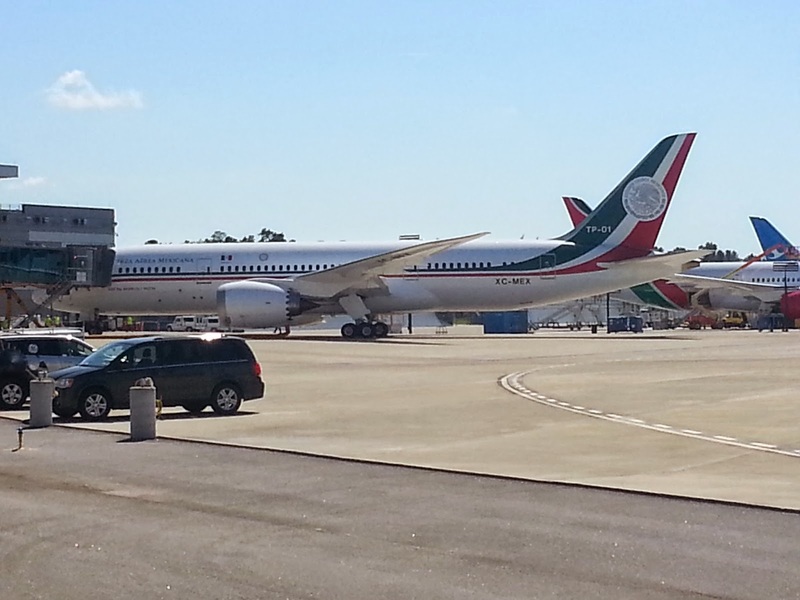 Mexican air force - Somewhat similar tail livery to the Kenya colors directly behind it. 120 days to assemble a 787. Wow, that seems like a very, very long time, especially for a program nearing its' 200th delivery. Especially since many of the major components arrive stuffed and pre-assembled. Does anyone know how long does it take to assemble a 777? Is Branson flying in to take delivery of their first 787-9? As he is such a showman, I would expect so. Does anyone know? The 110 to 120 days include not just Gibsonassembly but all ground and flightby eating, painting and any time needed by the customernot pprepare for delivery. 737's come out @ 1.4 per day yet how long is required for assembly? 83 days for 777 is the appropriate comparison, thank you. This is where the 787 should be getting close to, after approx 200 deliveries. Taking another 30 days is a failure in my book, as this is no longer a new program. Also, one would think efficiencies learned from other programs would be built into the 787 from the start and therefore assembly should be FASTER than on the 777. Oh well, until McNerney is gone, Boeing will never excel as it did when Mulally ran commercial. I agree. It's sad that whatever lead Boeing got with the rollout of the 787, they seem more than willing to relinquish to Airbus due to continual production issues. With any other business, any business without such powerful backing, it wouldn't be allowed to continue. Boeing can do better. More misguided fan worship I have never seen -- is Mullaly your uncle? The system put in place to design, engineer and build the 787 was done by Mullaly. It was a train wreck barreling down the tracks when McNerney took over -- not much he could do to change it overnight -- a lot of inertia there. Things are getting better. 2) selling ZA006 to the Mexican Air Force was a good move for both. The test frames turned out to be heavier than expected, a detriment for a busy carrier, but regardless of application, the Mex-AF won't fly it that many hours. Boeing unloaded an otherwise unwanted air frame and the Mex-AF likely got a Very Good Deal. Win-Win. Randy Austin - I wish he was! Mulally turned around Ford, which is now a profitable company. Ford is the ONLY US car company that did not accept federal funds, unlike GM and Chrysler. This is regarded by all as one of the most remarkable large corporate turn-arounds in US history. he is regarded as the father of the 777, which was delivered on the exact date promised to UAL and the program was on budget. 787: Development costs $28+ BILLION over budget. It is impossible to calculate how many billions these programs together have cost Boeing, but I understand it is north of $50 billion. ALL of this is under McNerney. Let's simply agree we have a different idea of what "success" means. BTW: Mulally is the LARGEST Ford non-institutional shareholder, as he was rewarded by that board for his exceptional performance. McNerney is a duffer in comparison. Is he YOUR uncle? Uresh - Have you or anyone seen this article in Av Week today? It's about AI PARTING OUT??? a 787! What's going on with this? "787: Development costs $28+ BILLION over budget." Half of the figures are for developing the first 40 frames which are LN4 through LN43. Boeing would only lose anywhere from $150 to $200 million for those frames which is about $7 billion instead of $16.3 billion. So flash forward to 2014, the entire program cost has been somewhere around $70 billion if we're talking about frames up to LN250. Now Boeing is hoping to sell up to 3000 of the 787's which means that the program cost could be somewhere around $600-$700 billion total. Profit from the 787 program could be somewhere around $150 billion to $350 billion. They expect to start turning a profit at LN400-LN500 or so. I am wondering what LN# is the quickest from roll out to delivery? It seems to be taking 6-8 weeks after roll out to delivery whereas the 737's rolling out seem to be delivered in about two weeks. ... the airline said the aircraft is "currently undergoing reliability improvement retrofit and will resume operations in November." Have you ever heard of Air Austral may order 1 or 2 787-8, probably some early produced? First I heard of it. Frankly, I'm not sure if they're in strong enough financial condition to buy a coffee maker let alone a new fleet of aircraft. It would be interesting to monitor progress in the engine competition, maybe as 2 additional columns in the "Current 787 Operators" table. With 197 aircraft delivered, I count 72 shipsets for RR and 125 for GE. What are you talking about? Charleston has almost half the amount as Everett does. Charleston is producing at 3 per month which is supposed to go to 7 per month by 2020. All while Everett is going to reducing and eventually eliminating the surge line. I'm not even sure how you arrived at 14 vs 1? Kaitian - I just used the tables. Today the figures are Everitt 14 and Charleston 2. Sorry to disappoint you. Swiss is not a customer for the 787. Said picture is photoshopped. That's a dang good job of the photo then. Cause the car lights even show up and are awesome in the photo lol and were talking about the view of the plane on the copilots side correct?? 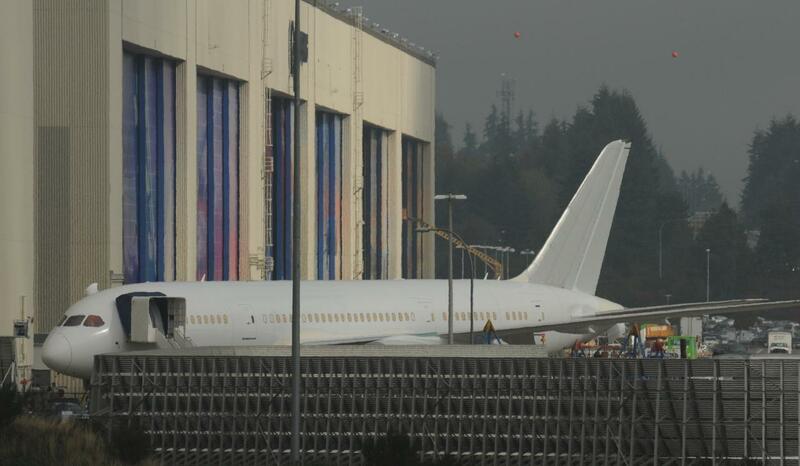 Ureshs, LN11 is on the flightline now, LN22 inside the EMC, LN246 outside, as well LN139 (this one probably temporarly). I forget to ask. Do you know line numbers of LOT Polish Airlines' last two 788s? The spreadsheets have all the latest information. I ran across the registrations planned for the KLM 787-9's, maybe they could be included in the spreadsheet ? Obviously not. Which LN are you referring to? List them. What criteria are you using?